#JohnMaxwell | Go, Leader, Grow! Remember, our work is not about quotas or reports. Our work is about PEOPLE. We tend to focus our work on data, reports, spreadsheets, etc. When we do this, we miss the most important part of our day – the people around us. So we need to intentionally value others. How do we do that? For me, one of the most effective ways to value others is to intentionally verbalize my appreciation of them and speak potential into them. I have observed leaders are sometimes hesitant to verbally value their team members. In fact, years ago I had a boss tell me, “I won’t tell you that you did a good job. Want to know why? Because if I do that, you won’t try any more.” This person knew nothing about me or people. Regardless of your position, we all like to hear “job well done” from time to time. It does motivate people. I have been pushing myself to make the time to look a team member in the eyes and tell them “thank you” for their efforts. I’m working harder at verbally giving them kudos. I’ve also been intentionally speaking potential into others (i.e. sharing my vision of where I see them growing and ways I will help them get to their goals). Last week, I gave a leadership book to an emerging leader and challenged them to read it. I’ve offered that after each section, I would take him to lunch to discuss what he’s been learning. Intentional. Purposeful. Direct. I’ve had leaders in my life who have done this. An independent grocery store chain owner did this for me almost 30 years ago. “As I watch you work, I’m convinced there’s nothing you can’t do if you set you mind to it.” Those words were (and still are) gold to me. The founder of an international music organization taught me that anything is possible. Don’t accept “no” as the final answer – there is always a way to make something happen. These words helped me maneuver through tough situations in Indonesia and in Communist-controlled Estonia (25+ years ago). I apply this mindset in my life today. I speak potential into my own son during baseball season. I’ve seen my own words become reality to him. I hope he holds on to these words. There is no down-side in speaking value and potential into another human being. But we miss out on changing someone’s life when we withhold empowering, encouraging words. Today, speak value to someone else. Speak their potential. It will change them. It will change your team, your company, your community. Leaders truly value others – and it is intentional. 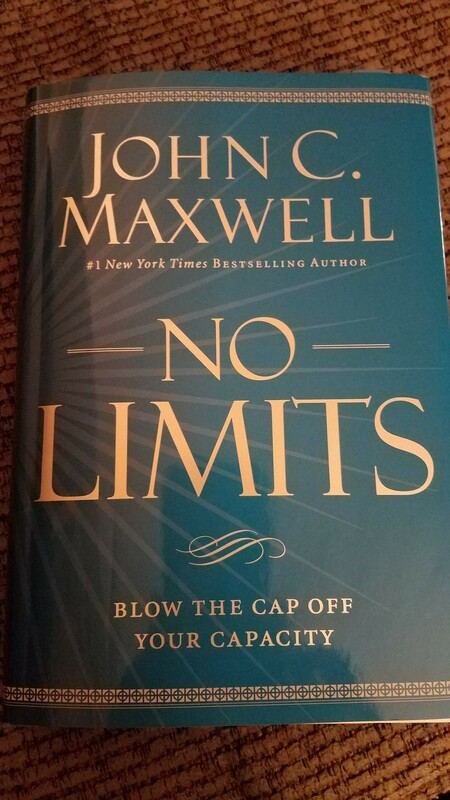 I am about to finish John C. Maxwell’s new book, No Limits. If you have not read this book, order it now! It will increase your capacity to lead and succeed! Here’s an excerpt from the chapter on “Risk Capacity”. Identification: Who am I? I am a person of worth attempting to do something worthwhile. Action: What will I do? Take action and do the right thing regardless of feelings. Emotion: How will I proceed? I will allow my actions to shape my feelings.